Marketers understand Facebook can drive referral traffic back to their brands’ websites and increase customer loyalty through quality social care initiatives. However, measuring ROI has always been difficult, which has put Facebook marketing on the back burner for many organizations. A couple hundred Likes and several dozen comments may seem like the results of an effective campaign, but basic interactions don’t always tell the whole story. Fortunately, Facebook has just unveiled a new analytics feature aimed at helping marketers better understand how their featured stories and ads do on the social network. The social media giant introduced a conversion measurement function that allows brands to measure the ROI of their ads by calculating relevant user actions. For example, when users navigate from Facebook to an ecommerce site to purchase a product, the feature records that action and credits the sale to the Facebook ad. Marketers can use optimized CPM to direct ads toward relevant audiences. 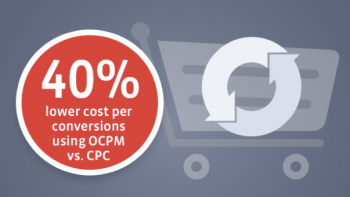 In fact, Facebook has already run preliminary tests on the OCPM function and found that ads reduced the cost per conversion by approximately 40 percent when compared to CPC ads with similar budgets. For example, Fab.com reduced its cost per new customer acquisition by 39 percent when using the new feature. Additionally, the Democratic Governors Association used the same tool to reduce its cost per conversion by 85 percent. Overall, the new Facebook feature gives social media marketing professionals greater control of their campaigns by showing them what works and what does not. The tool should assist brands in delivering successful social media content to relevant audiences and saving companies money in the process. With new resources like the OCPM function, Facebook has become a more cost effective solution for businesses across all industries.